Welcome to our 2018 Cutest Pet Contest! We are doing the contest a little differently this year to allow for 2 first place winners! 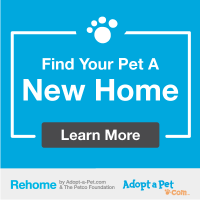 We'll have 2 categories for our awesome pets; Rescued/Adopted pets, and Pets obtained from Breeders. The contestant who gets the most votes in each of the 2 categories will win first place! In addition to the 1st place prizes, the winner of the Rescued/Adopted Pet category will have the option of having their pet's photo hang in our new shelter, donated by Martha Peoples Photography! Votes are only $5 each, and you can vote as many times as you'd like. The pet in each category with the most votes by 5 PM Wednesday, March 21st will officially win the 2018 Cutest Pet contest! We will post frequent updates here (below the photos) and on our Facebook page with the top vote leaders. Winners will be announced here & on our Facebook page on or before 9 AM Friday, March 23rd. Online through PayPal. Just click your favorite photo(s) below. The contestants are listed in alphabetical order to help you find your favorites. You do not need a PayPal account to vote, only a credit card. Vote at our Second Chances Thrift Store. Second Chances Thrift Store. (Mon-Fri 10-5, Sat 10-3) 2900 W. Vernon Ave, Kinston NC. 252-522-0787. *All votes must be received by 5 PM on Wednesday, March 21st. Special thanks to our fabulous photographer friend, Martha Peoples, for hosting this fundraiser, to our prize sponsors, and to all our pets and their families for including them in this fundraiser. Sincerest appreciation to all the contestants and their families/friends. Rest assured your donations will be used to help the shelter animals. TIGGER and BELLA are our two winners this year!!! Congratulations! We think ALL the contestants are #1! There was some mighty fierce competition this year, especially from Briar, Otis, Trixie the Cat, Yager (in the 11th hour), Bogey, Buzz, Trixie the Dog, Cobb, and Daisy Bell. Thank you all!! 1:00 PM- This is our last update today until the contest ends at 5 PM. Best of luck to all our awesome contestants! In the Adopted/Rescued Category, Briar is still holding onto the lead, and Trixie the Cat is in 2nd! Tigger & Otis are tied for 3rd! In the Professionally Bred category, Trixie the Dog has taken the lead! Bella’s in 2nd place, Buzz is in a close 3rd, followed by Bogey and Daisy Bell! Votes can also be made at our Second Chances Thrift Store on Vernon Ave, Kinston until 5 PM today. Photos by the awesome Martha Peoples Photography! LAST CHANCE TO VOTE TODAY, 3/21!! We'll post the last update today~ 1 PM. Contest ends at 5 PM. Best of luck to all our awesome contestants! In the Adopted/Rescued Category, Briar has regained the lead, and Trixie the Cat is in 2nd! Tigger & Otis are tied for 3rd! In the Professionally Bred category--Bella is leading the pack, followed closely by Trixie the Dog in 2nd place! Buzz is in a close 3rd, followed by Bogey and Daisy Bell! Last hours to vote, contest ends Wed, 3/21 @ 5 PM. We'll post an update 3/21 in the morning and again around noon. Best of luck to all our awesome contestants! Thank you very much for supporting the Lenoir County SPCA. In the Adopted/Rescued category, Otis and Trixie the Cat are still tied for the lead! Briar is still in 2nd, followed closely by Tigger in 3rd! In the Professionally Bred category--Trixie the Dog is still in 1st place, Bella & Buzz are tied for 2nd, with Bogey very close behind! Votes can also be made at our Second Chances Thrift Store on Vernon Ave, Kinston. Open Mon-Fr 10-5, Sat 10-3. 3/19/18: ONLY a FEW MORE DAYS to VOTE in our 2018 Cutest Pet Contest! Contest ends Wed, 3/21 @ 5 PM. All donations benefit the shelter animals of the Lenoir County SPCA. In the Adopted/Rescued Category, Otis and Trixie the Cat are now tied for the lead! Briar has slipped to 2nd, followed closely by Tigger in 3rd! No changes in the Professionally Bred category--Trixie the Dog is still in 1st place, Bella & Buzz are tied for 2nd, with Bogey very close behind! Keep those votes coming! To vote via PayPal and see all the contestants simply click on your favorite pet in the list above. In the Adopted/Rescued Category, Briar is still holding onto 1st place, followed closely by Otis, Tigger & Trixie the Cat all tied for 2nd! In the Professionally Bred category, Trixie the Dog is still in 1st place, Bella & Buzz tied for 2nd, and Bogey is very close behind! In the Adopted/Rescued Category, Briar is still holding onto 1st place, followed closely by Otis, Trixie the Cat & Tigger! In the Professionally Bred category, Trixie the Dog has taken 1st place, Bella is in 2nd, with Buzz and Bogey nipping at their heels for the lead! 3/14/18: In the Adopted/Rescued Category, Briar is now in 1st, followed closely by Otis, Trixie & Tigger! In the Professionally Bred category, Bella is holding onto her lead, followed closely by Buzz and Bogey! 3/10/18: In the Adopted/Rescued Category, Otis and Trixie are tied for 1st with Tigger and Briar nipping at their heels! In the Professionally Bred category, Bella is in the lead, followed closely by Buzz and Bogey!